They’re baaaaack! Lovers of the warm seasons in the southern United States, my resident Carolina anole, Anolis carolinensis, lizards have emerged from winter dormancy. …who’s (thankfully) is not much of a hunter, instead preferring to carry anoles around in his mouth, yowling all the while. It’s quite a trick caterwauling while transporting frightened lizards between his teeth and I’m not altogether sure how he creates those sounds while holding onto his little captives. Nuri typically drops the not-really-doomed reptiles as soon as he sees that I’ve spotted him with his gift. Of course, I have to compliment Nuri with a Good kitty! as I scoop up the panting prey to relocate to a safer, cat-free spot. …but transforms to green before my eyes. He skittered off to an unknown hiding spot shortly afterward to complete his greening-up. They would both like to remind gardeners to keep domestic cats indoors and to appreciate and foster a safe place for garden wildlife and on April 1st, no foolin’–get ready for Wildlife Wednesday. Please post about wild happenings in your gardens to celebrate wildlife who need the gardens that we gardeners love. This entry was posted in Wildlife Gardening, Wildlife Habitat, Wildlife Wednesday and tagged Anolis carolinensis, Carolina anole by Tina. Bookmark the permalink. Love me some Anoles. 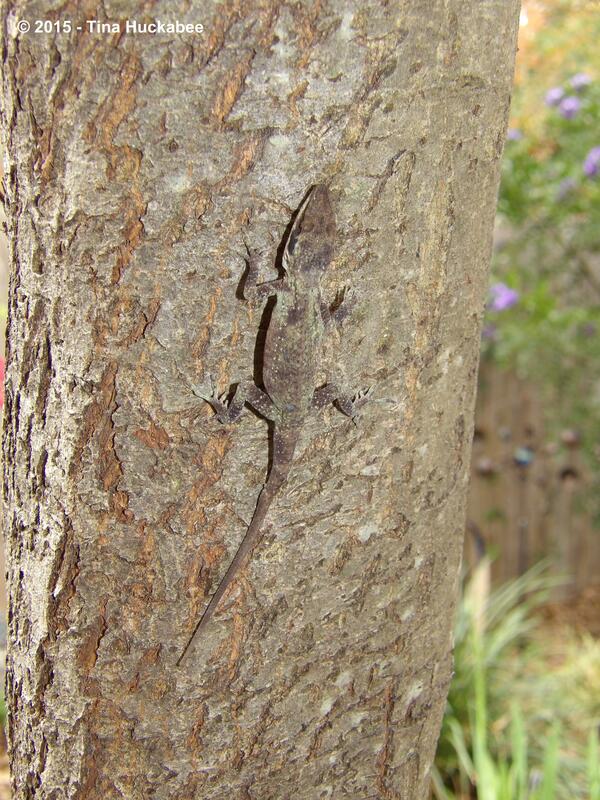 Eastern Fencepost Lizards, too, with that little white stripe down their backs. The most fun is when you notice one chewing on what must surely have been a pesky insect. Lizards are the bomb in gardens, so fun to watch. One of the funniest stories about my male, Nuri, is that once I saw him pop out of a Turk’s Cap with an anole in his mouth. As I fussed at him to drop it, I realized that the anole had some smaller beetle in his mouth. My cat lost out on his prey, but the anole held onto his. Yeah, I love my cats, but they are real problems in the outdoors. Both of mine are indoor/outdoor, but I will say that my male, who’s out more, is not much of a hunter. The anoles are his main interest. And rats/mice–he’s good about catching those. He’s not much of a birder. My little girl cat, Astrud, she’s the better hunter, but spends most of her time indoors. Thanks for the link–domestic cats are, next to habitat destruction, the main threat to native bird populations. I love the anoles. They are such friendly little lizards. I remember I caught my first one back in about 5th grade or so when I was visiting relatives in northeast Texas. 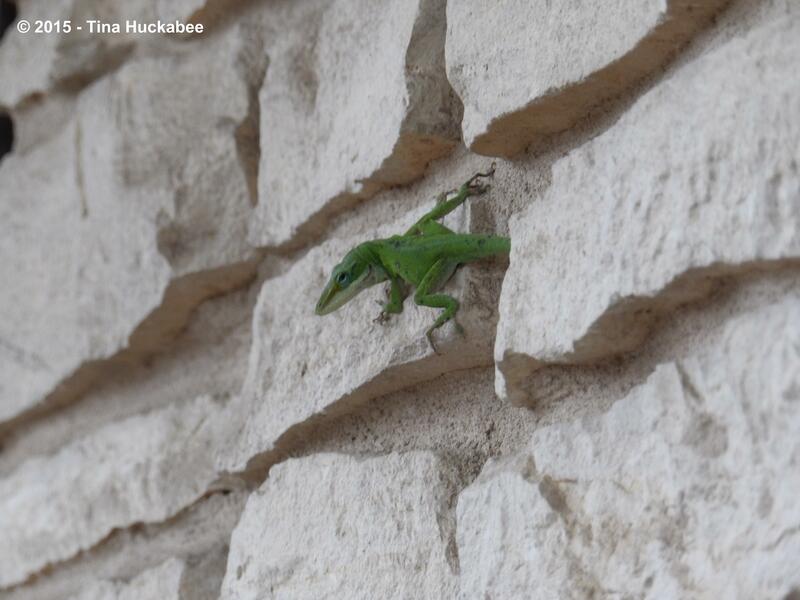 I grew up in Wisconsin – and you only saw anoles at the pet stores there. Yesterday I caught one that made his way into my gardening shed. I knew he wouldn’t want to stay in there, so I captured him, held him long enough for some photo ops (to be posted on the next Wildlife Wednesday) and released him back into the garden. My guy was bright green, but I love the pics of yours on the tree with their perfectly camouflaged colors. They are friendly and so interesting to watch. They’re very abundant in my gardens, but I assume that’s true for most of us. Nice that you rescued your lost one–I’ve had similar things happen: they get into the house and I capture and release to the outdoors. TexasDeb at austingrodolce once posted just how long it took for an anole she observed to turn color, it was a great post. The other lizard I just love, but don’t have in my gardens is the Texas Spiny Lizard, https://www.google.com/search?q=texas+spiny+lizard&ie=utf-8&oe=utf-8 They were common in the Zilker garden where I worked and I know that they’re around, I just don’t have them in residence. That’s another with a fun personality to observe. What a lovely lizard, a great photo to show how he changes colour. We don’ t have these pretty creature here, I wish we did. They are really fun lizards in the garden, I’m sorry you don’t have them. I know it’s weird to say, but they do have so much personality. I love these guys! I hope to see a few in my yard here. I had a few at our last house. They’re so much fun, aren’t they? Just wait until your little one is old enough to watch and enjoy–that’s something to behold. Oh, my goodness. I can hardly wait. Tina, your garden wildlife is exciting, we only have 3 species of Lizard over here, and very occasionally we see a common Lizard in our own garden, they are very small though up to 15cm long, so not as eye catching as your Anole. That’s interesting that there are only three. I wonder if it’s the colder climate? This green anole is specific to warmer climates and of course, in desert regions, there are quite a few species. I miss the anoles, geckos, chameleons, and other lizards that I saw in Florida! We do have a few lizards here in Wisconsin, but they’re concentrated in the sandy regions of the state and are all listed as either “special concern” or “endangered.” Lizards are so entertaining to watch! I wish we had these guys in our garden. Of course, maybe they’re around and I just don’t see them! I loved lizards when I was a kid but haven’t seen any of this type in years. I’m surprised you don’t have them in north Texas. Hmmm. Is it your drought? In 2011, that terribly hot/dry summer, I remember watering a potted agave in the back of my garden. As the tiny bit of water dripped through, this anole sneaked up and started licking the water. Poor little guy–no moisture anywhere. I make sure I always have some available water for the lizards, et al. I just saw my first anole ever in my current garden – after 6 years of gardening here. I was thrilled! I had tons of anoles in my former garden in central Austin, but here in NW Austin all I’ve ever seen are the bigger, shyer, Texas spiny lizards. I’ve wondered if they somehow out-compete the anoles, although they seem to occupy different habitats, the spiny lizards being mostly arboreal. 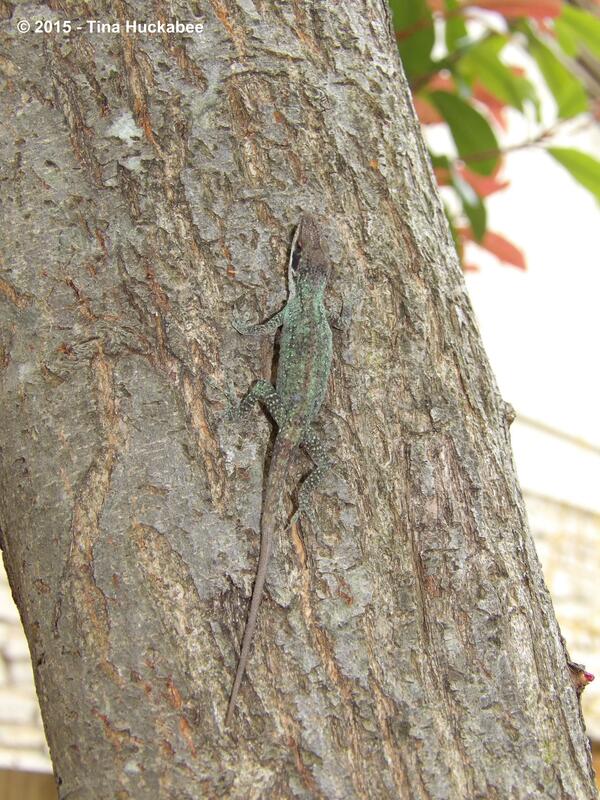 Anyway, anoles are a favorite of mine, not camera shy at all, and I hope to see it again soon. Yay! So glad you have one. And where there’s one, there are probably others…. I love Texas spiny lizards, they were abundant at ZBG and I enjoyed watching them and they, me. Or so it seemed. It’s interesting that you don’t have the green anoles–I thought they were throughout this area. Maybe some other predator hunts them? Gorgeous photos! Love the contrast in the first and was so surprised by the second. At first I thought it was sunscald but NO it was a little lizard. Neato. Nope, they can change as you watch. So fun! I meant I thought that the bark had a touch of sunscald — like when they split open. I must have been looking sideways or something to miss the lizard. Ah, misunderstood. The bark belongs to an old photinia. I hate those trees/shrubs, but it was there when we moved in. The birds, however, are in it all the time, so it’s good for cover.